In this post, I will explain the dashing backwards problem to the best of my ability and go into the possible remedies. First, you might wonder why I claim that dashing *backward* is a problem. Why should it be harder to dash backward than forward? The reason is that forward dashes, and also dash-dance dashes, allow one frame of leniency for half inputs. This means that if you press the stick somewhat slowly, so that the game registers one frame as half forward and the one after as full forward, you’ll still start dashing by frame 2. Backward dashes, however, work differently. If, on the first frame of pushing backward, the game registers a half press, you will get stuck in the turn animation for 5-9 frames (depending on character) before you can start your backward dash. Pause and frame advance or slow down to compare (gfycat controls are at the bottom right). In other words, pushing slightly too slowly will only delay your dash by 1 frame if pushing the stick in the direction your character is facing, but in the opposite direction your dash will be delayed by 4-8 frames. This is a huge problem for serious play. Dashing backward is something you do quite often, especially in neutral and during tech-chases, so avoiding this additional delay is really important. 4. What kind of manual thumb input to aim for. Grounded actionable control stick map. Each pixel corresponds to a control stick x|y couple. When you hit the smash turn area from the first frame of inputting backward, you are able to transition to backward dash on the very next frame. Thus, you only spend one single frame in the turn animation. Smash turns also turn you around completely from their first frame on, which is important for jumping and dropping from a ledge during the turn animation. If the first frame of backward input has less offset from neutral position (below 0.8, to be precise), you do a tilt turn, during which dashing backward will only be possible a few frames later. (A list for the exact amount of frames for every character can be found here.) Additionally, jumps and falling off the ledge will return your character to his original orientation for the same 5-9 frames mentioned above, so if you try to do a JC grab behind you so that you only dash for one frame, doing a tilt turn by accident will cause you to grab in place and not even turn around. Therefore, our goal is to move from neutral position to full backward as quickly as possible. On average¹, you need to complete this motion within half a frame or 8.­33 milliseconds. That’s a really short amount of time, so we should try our best to remove all handicaps that increase the time we take for this input. 1. The disjointed zone [DZ]: this is the small area in the middle of the control stick where you can move your stick without applying force and without causing any in-game analog value change. 2. The loose zone [LZ]: within this zone, you can still move the stick around without resistance, but the in-game values will change. 3. The resistance zone [RZ]: this should cover most of your control stick input values, where pushing the stick will depress the inner spring and and cause in-game values to change. The DZ is irrelevant here unless it becomes so large that dashing isn’t possible any longer. While a small amount of LZ can make things like reverse specials easier, here it is completely detrimental as it can lead to entering the tilt turn zone before consciously starting the backward input. The RZ always sits just outside of the DZ and LZ (if existent). Depending on controller stickbox type and amount of wear, it can have different borders to the other zones. Even a low-resistance spring still has enough base length so that it doesn’t cause an increase of DZ or LZ. The two things that usually happen to heavily worn controllers—less resistance and increased DZ or LZ—are independent and simply correlate. Thus, you can exchange a fresh stickbox’s spring with a heavily worn or simply thinner one (see images below) to decrease spring resistance without increasing DZ or LZ. Additionally, it should also help to modify a high-resistance spring to have less resistance or buy a weaker one somewhere, but I don’t have any experience with that. There seem to be at least two different kinds of springs in type 3 stickboxes. The left one is thinner, so it is weaker (and thus more desirable here). The thinner spring was taken from the left stickbox, the thicker spring from the right one. Maybe the black bottom plate indicates what spring is inside? Note that it often makes a difference in which direction you align the two ends of the springs. By default, they are usually pointed upwards, but if you have problems after that, rotate it by 45° until back dashes in both directions work well. The first purple value at the bottom of the monitor shows current control stick x value. Anything from ±0.2875 to ±0.7875 will register as tilt turn, and everything at -0.8 or less / 0.8 or higher will register as smash turn. Controller movements have a delay of about 55 milliseconds until they are shown on the screen due to the Gamecube’s processing time of about 3 frames. This kind of input method increased my success rate by 32% (from 69% to 91%) and decreased the average amount of milliseconds spent within the tilt turn area by 54.7% (from 11.5 to 5.2 ms). Using this kind of input in a match is not always feasible, but whenever you have enough time and know in advance that you want to dash back, it should increase your rate of success drastically. However, even if you manage to spend only two milliseconds within the tilt turn zone, on your way from neutral to the smash turn zone, there’s still a chance of the game polling for the next frame’s input just during these¹. 100% could only be reached by either moving your thumb at the speed of light or replacing the analog stick with a digital stick. 1 frame is spent within tilt turn range (0.4875). If you start holding strong backward (>=0.8) at the first frame after lag from a previous move, it doesn’t matter whether you held the stick within the tilt turn or smash turn area the frame before. This means that if you time your backward input perfectly at the end of the last action, dashing backward is just as easy as dashing forward. The reason for this is that the game only polls for the dreaded tilt turn as soon as you are actionable. By moving through that area just before you are actionable, you ensure that when the game checks for turning, you are already at smash turn area. 1-frame turn backward dashes are unnecessarily hard to input in Melee; even with a “perfect” stickbox you will still need to press it with extreme speed or frame-perfect timing to be consistent with. In Project M, Magus fixed this by adding the same frame of leniency we have for forward dashes to backward dashes. ¹Depending on the time left until the next frame polls for your control stick position, you will have between 0 and 16.66 milliseconds to complete the motion. Fizzi has explained this very well with diagrams in his post on lag. Kadano I love everything you’ve ever done thaaaaaaanks! Amazing work! Another thing worth adding that helps me is making sure you’re moving the stick as horizontally as possible, not wasting the thumb’s movement on the vertical axis. I’ve never had ANY problems dashing backwards no matter what controller I’m using (though I’m sure some controllers after flawed). I think players should make sure they are inputting the dash back properly before blaming their controller, and also test dash backs outside of matches to be sure they aren’t just inputting the dash before landing lag is finished due to urgency of a missed aerial. This article is top quality. I really look forward to reading any of your future posts. I think that smash turning (and dashing back consequently) is easier in Project M mainly because the smash turn zone was enlarged and the tilt turn zone was made really tiny. I have never done proper input mapping for pm though, so I’m not 100% certain on this, but I think it’s likely. It’s actually hard to tilt turn in pm without hold buffering it. 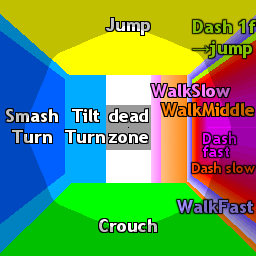 The change has other consequences as well: the smash turn zone is considerably bigger than the dash zone, which trivializes dash pivot techniques such as doing turn tilts straight from dash. Melee’s dash threshold is 0.8 while PM’s is 0.6. That is, you have to smash the stick to 80% “full” left or right to dash in Melee, and only 60% in PM. It’s intentional and in many people’s opinions, a positive feature of PM along with the buffer Kadano described to backwards dashes. Out of curiousity, what’s the threshold for smash turn in PM? To catch fox in a chaingrab in the 20’s%, if he does slight backwards DI you need to pivot grab. In fact, you have to dash backwards and pivot grab. Does that mean that even for a frame-perfect marth, the 0-30+ chaingrab is not guaranteed on FD? Say you upthrow fox and his DI necessitates a backwards dash pivot grab. If you need to do it on the first possible frame, the extra leniency from the lag of throwing Fox upwards will allow you to consistently dash backwards. If you need to do it any later, you can dash backwards on the first possible frame, and then pivot and shield stop in the appropriate position for however many frames necessary before grabbing. Whenever you need to pivot grab, forward dash to smash turn grab works too. So you really don’t need to do back dashes for Marth’s chaingrab. Does the new sm4sh controllers have this problem? I used the white controller for a while now, and when I switched to a sm4sh white controller I couldn’t backdash consistently. I keep getting caught in the pivot animation. Also, if I try to do a turnaround fair after a grab on marth, I keep missing the input and instead do a jump bair. The new sm4sh controller is great for shield drops, but I guess I’ll just use my old controller for now.